Please note that on December 1, 2015, the Court's local rules regarding the filing of sealed documents in civil cases were significantly amended. With respect to civil cases, these changes effectively superseded the pilot project for the emailing of sealed documents to the Court in which many judges had been participating. 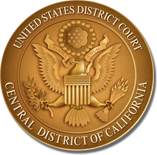 Attorneys must now file most sealed documents and applications for leave to file under seal in civil cases electronically, using the Court's CM/ECF System. Please click here for more information about e-filing sealed documents, and be sure to review the changes to Local Rules 79-5, 79-6, and 79-7 before filing any sealed documents or applications for leave to file under seal. Below is a list of judges who were participating in the pilot project prior to December 1, 2015. Please note that some judges may still be participating in the pilot project with respect to criminal cases, or other sealed documents not covered by the new civil rules, such as documents filed by pro se litigants or in sealed civil cases. Please review your assigned judge's procedures and schedules to determine what your judge requires for the submission of sealed documents that cannot be e-filed pursuant to L.R. 79-5.2.2.